The new Haulotte HTL5210 telehandler. Haulotte has released a new lineup of heavy load capacity telehandlers, including the 5.2-tonne lift capacity HTL 5210, which are suited to the heavy construction, mining, oil, port cargo handling and recycling sectors. 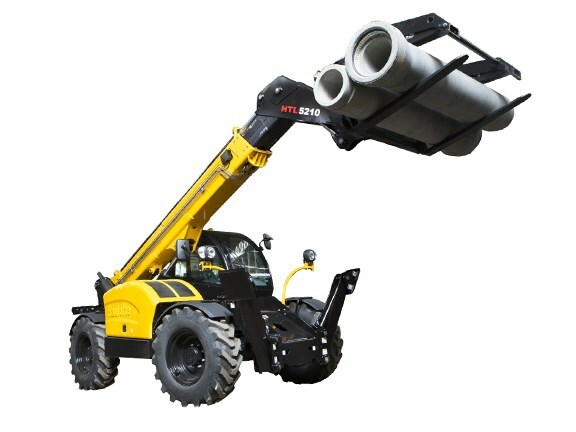 The French company says the rough-terrain HTL 5210 can reach to a height of 10 metres — giving it the best load rating in this class — and has a maximum forward reach at 3.5 tonnes to 5.8 metres with the stabilisers included in the standard configuration. A rear axle locking system also aids lateral stability and gives a very high load rating performance for the upper section. "Easy to operate on non-stabilised surfaces, HTL5210 is a four-wheel drive and steer all-terrain telehandler," Haulotte says. "This model is equipped with a hydrostatic transmission for high precision movements and an inching pedal system for a smooth and easy approach. "The result is an extremely versatile range of applications based on the availability of numerous compatible accessories." The Haulotte HTL 5210 telehandler is powered by a Tier 3-compliant Perkins 95-horsepower (70kW) engine in the Asia-Pacific region. Other features include a high-strength monoblock chassis, hydrostatic transmission and inching pedal, a Load Moment Indicator (LMI) and a smart-control four-in-one joystick.